It would be terribly cliché to begin a review of a new Mazda MX-5 Miata by describing it as one of the most visceral, engaging, and fun to drive sports cars money can buy, so I’ll start by saying this: the 2019 Mazda MX-5 Miata is one of the most visceral, engaging, and fun to drive sports cars money can buy. Its back-to-basics approach and devotion to the simple joy of driving have remained constants throughout its roughly 30 year run. And even though this is a car that is not about the numbers, a handful of numbers are indeed what have caused a stir over the model’s 2019 update. Thanks to a few old-school tuning tricks and lightweight engine internals, the naturally-aspirated 2.0L 4-cylinder now produces 181 horsepower and 151 lb-ft of torque, up from 155 and 145 in the previous model. It would take a back-to-back comparison to tell whether the power increase is really noticeable, but there’s no question that the engine produces plenty of power for a tiny sports car with a curb weight of only 1065kg. The real joy though is listening to the engine rev all the way to a 7500 rpm redline while flicking the sweet-feeling short-throw shifter into the next gear. You can even hit redline in three of the six gears without breaking the speed limit. Again though, what’s important to remember here is that the MX-5 is not at all concerned about the numbers. Horsepower, 0-60 runs, and lap times don’t tell the story of how wonderfully entertaining the MX-5 is to drive. Most modern sports cars don’t move your pulse until you’ve hit illegal speeds. The MX-5, however, thrills you at just about any speed. The steering is light and communicative. The brakes have a nice consistent bite. And the chassis responds eagerly to inputs with amazing agility and accessible limits. You don’t have to drive it like a hooligan to get a thrill out it, and that’s really what differentiates it from just about every other sports car on the market. 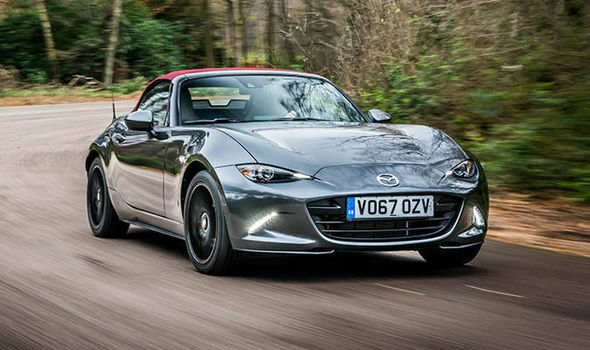 Of course, the fun-to-drive nature of the MX-5 is nothing new. Every generation stretching back to the roadster’s introduction in 1989 has earned the same high level of praise. To confirm this, I briefly test drove a well-preserved 1990 model from Mazda Canada’s heritage fleet right before picking up my 2019 tester. Despite having nearly three decades under its belt, Mazda’s classic roadster hasn’t lost a bit of its charm. It may be light on features and frills, but the same basic qualities remain the same: a nimble lightweight chassis, crisp-feeling shifter, and endless smiles per mile. 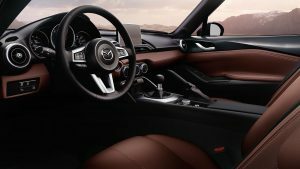 If anything, the lack of features and comforts just puts more emphasis on the basic visceral qualities that make the MX-5 so great. It would be just about impossible to sell a new car without a few comforts, and the latest model has more than its fair share. Standard features include a navigation-ready 7 inch touchscreen with internet radio, a backup camera, and active safety technology including low-speed emergency braking, lane departure warning, and high-beam control. A tilt and telescoping steering wheel combined with supportive sport seats mean that a comfortable seating position is easy to find. Equally easy is the lightweight manual soft-top, which can be folded up or down in two seconds with little effort. 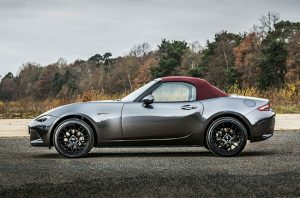 For those who prefer the looks and added security of a hardtop, the MX-5 RF is available as well. Three decades worth of technology may separate the 2019 Mazda MX-5 from its 1990 ancestor, but the similarities far outstrip any differences. Thanks to the careful preservation of its lightweight, perfectly balanced, rear-wheel drive formula, the MX-5’s soul has largely remained intact through the passage of time. That’s something that can’t be said of other long-running icons. The MX-5 is a perfect version of what it is, a tiny little roadster time capsule, and let’s hope it always stays that way.